The cell membrane is also called the plasma membrane. You can think of the membrane as the "skin" of the cell. Anything outside of the cell is considered "extracellular" and the contents inside the cell are considered "intracellular". ​The cell membrane protects the cell by creating a barrier between what is inside the cell and what is outside the cell. The cell membrane is made up of a double layer of phospholipids. Proteins, sugars and lipids are also incorporated into the cell membrane. ​The cell membrane surrounds the entire cell and act as protection. You can think of the cell membrane as acting like our skin! In addition to this, the cell membrane does something our skin can’t do... It regulates what comes into the cell and what goes out of the cell. For this reason, we consider the cell membrane to be “SELECTIVELY PERMEABLE” which means that it allows some substances to enter or exit the cell, but not others. This is a very important function. The Cell Membrane is selectively permeable due to its structure. The cell membrane is made up of a phospholipid bilayer. 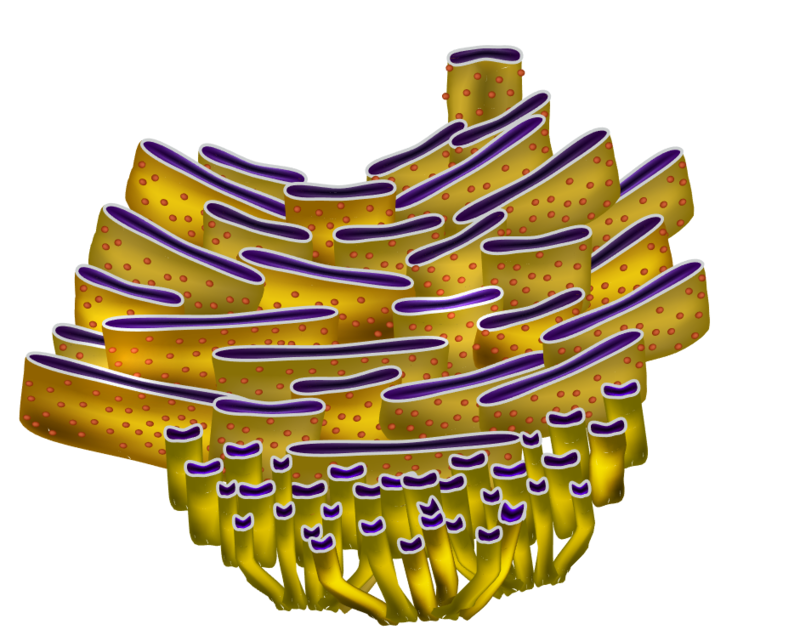 ​ The phospholipid bilayer of the cell membrane has a unique structure. It is made up of an inner layer and an outer layer of phospholipids that are oriented with their 'tails' facing each other. Phospholipids are considered amphiphilic, because they contain a polar, hydrophillic head that consists of a phosphate group and two nonpolar, hydrophobic fatty acid chains as 'tails'. The vesicle consists of a small amount of fluid (and sometimes particles) surrounded by a phospholipid bilayer. This bilayer is made up of the same phospholipids that are found in the cell membrane of the plasma membrane. This is due to the fact that vesicles are actually made from the cell membrane itself! Vesicles move larger particles (like proteins) or large amounts of molecules (like neurotransmitters) across the membrane via endocytosis and exocytosis. 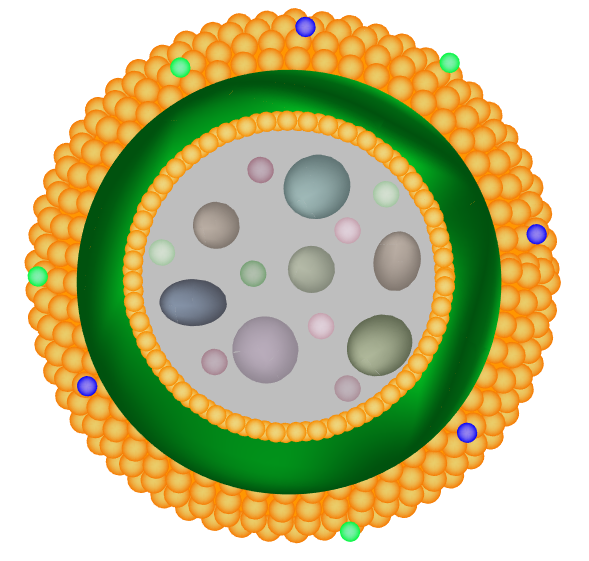 Vesicles are also used within the cell to transport substances from one area to another. The Main Function of the Nucleus is to Hold the DNA. The nucleus is surrounded by the nuclear envelope, which is essentially a membrane (a phospholipid bilayer) that compartmentalizes (or separates) the nucleus from the rest of the cell. The nuclear envelope is similar to the cell membrane, except that it contains more pores. The pores allow substances like ribosomes to pass through. The nuclear envelop is selectively permeable. The liquid inside of the nucleus is called the nucleoplasm. The nucleoplasm is separated from the cytosol of the cell. ​The main function of the nucleus is to house the DNA. DNA is associated with histone proteins that act to package the DNA into bundles. The name for the collection of DNA and histone proteins is chromatin. The DNA holds the instructions for protein synthesis (as well as other instructions for the cell). The nucleolus is located inside of the nucleus. It is the largest structure residing inside of the nucleus. Its primary function is to make ribosomes. The ribosomes then leave the nucleus through one of the nuclear pores. Ribosomes function as the site of protein synthesis for the cell. The nucleolus is usually visible as a darkened area lying within the cell's nucleus, as you can see in the electron micrograph. Electron Micrograph of a nucleus and nucleolus in an animal cell. The Main Function of a Ribosome is to Be the Site of Protein Synthesis. ​After the ribosome is assembled (made) in the nucleolus, it leaves the nucleus. Some ribosomes will end up as "free ribosomes" that remain unattached in the cytosol. Other ribosomes will attach to the nearby Rough Endoplasmic Reticulum. All ribosomes function as "the site of protein synthesis". Free ribosomes are used as the site for making water-soluble proteins, whereas the ribosomes that are attached to the rough endoplasmic reticulum act as the site for making proteins that will either be incorporated into the cell membrane or will be transported out of the cell (via exocytosis). The ribosome is the location of the assembly of the amino acid sequence that makes up the protein. mRNA is used as a template for the amino acids that are to be used. The ribosome is composed of two subunits that are made of ribosomal RNA (rRNA) and protein. The rough ER is composed of a network of membranous sacs or envelopes and tubules. The outside of the rough ER appears 'rough' due to attached ribosomes. The smooth endoplasmic reticulum (Smooth ER) appears smooth in comparison to the rough ER. This is because the smooth ER does not have ribosomes bound to it. The structure of the smooth ER is similar to that of the rough ER in the fact that it is composed of a membranous system of sacs or envelopes and tubules. Its structure differs in the fact that it appear smooth since it does not have ribosomes attached to it. ​ The smooth ER's main function is to make lipids. The smooth ER also functions to synthesize steroid hormones, metabolize lipids and even acts assists in detoxification of the cell. A lysosome is a membrane-bound cytoplasmic organelle that contain enzymes that can break down different biomolecules. The lysosome works to digest substances in a similar way that our own stomach does. The Golgi body functions to Modify, Package and Ship proteins! The Golgi body is able to sort the incoming proteins and can tell where their final destination should be. These proteins could be destined for a number of destination including secretion from the cell, inclusion in lysosomes, or incorporation into the plasma membrane. ​The Golgi Apparatus is made up of 3 – 10 “envelopes” called cisternae. You can think of the Golgi body as the Post Office of the cell. After proteins are made at the ribosome, the proteins travel to the Golgi body. The Golgi body will modify the proteins with strings of amino acid sequences (called signaling sequences) that will tell the cell where the protein is going to go! You can think of this process as "gift wrapping" and "placing a shipping label" on the protein! The mitochondrion is the "power house" or "engine" of the cell. 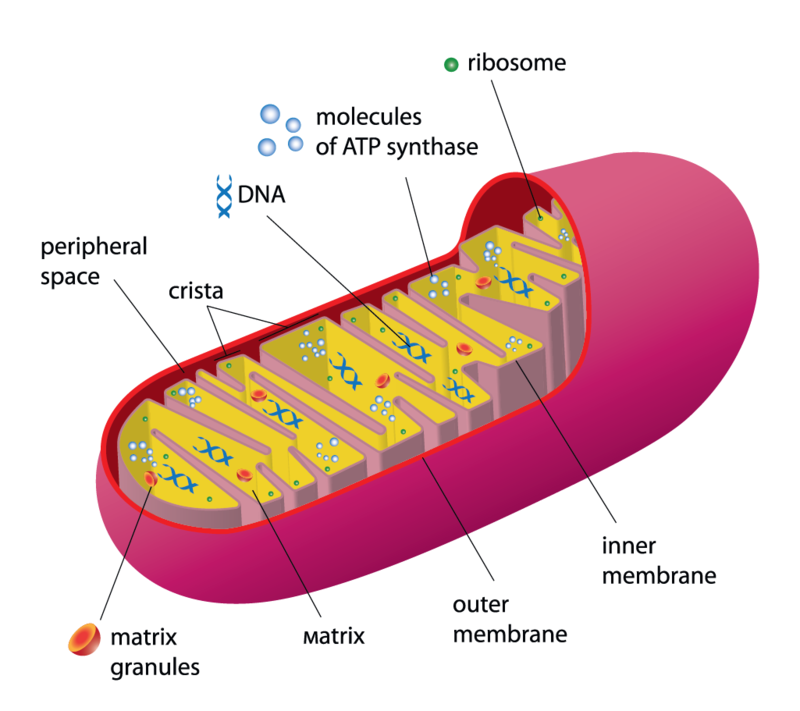 Our mitochondria makes energy in the form of ATP (adenosine triphosphate) that our cells can use. 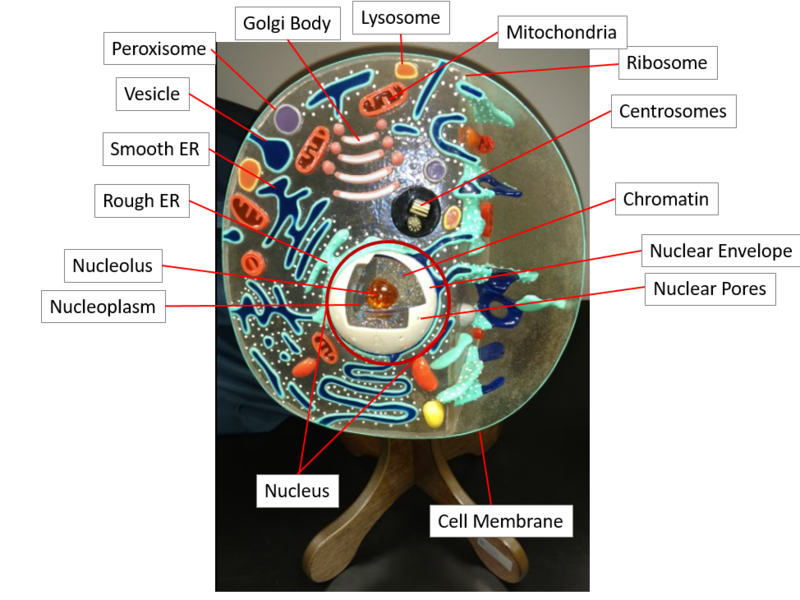 ​The peroxisome is a small round cytoplasmic organelle that functions to detoxify the cell. The peroxisome houses oxidase enzymes inside of membranous sacs. These enzymes act to catalyze the breakdown of harmful substances to the cell. Free radicals are specific forms of molecules that contain an electron which can be eaily removed from it and can cause unwanted reactions to occur within the cell. The most important enzyme for the peroxisome is catalase, which is used to break down the free radical, hydrogen peroxide. This is why they are called "peroxisomes". The cytoskeleton of the cell provides structure to the cell, in a similar way that our own skeleton gives us shape! In addition to structure, the cytoskeleton acts as a scaffolding within the cell that can be used to anchor certain organelles in place or as a roadway for molecules to travel on. Another main function of the centrosome and microtubules is seen during the cell cycle and mitosis (cell division). The centrosome organizes microtubules into a functional unit. It has a vital role in mitosis (cell division) in which the centrosomes act to form the mitotic spindle with microtubules. This spindle apparatus then connects to chromosomes, lines them up at the metaphase plate during metaphase, and then acts to pull sister chromatids to opposite sides of the cell during anaphase. ​The centrosomes are also involved in cytokinesis which is the final step in mitosis. The microtubules will function to pinch off the last remaining point of contact between the soon-to-be daughter cells. CENTROSOME Region close to the nucleus in eukaryotic cells. It is an area involved in the development of microtubules (often referred to as a microtubule organizing center) that are necessary for cell movements, e.g. the mitotic spindle. 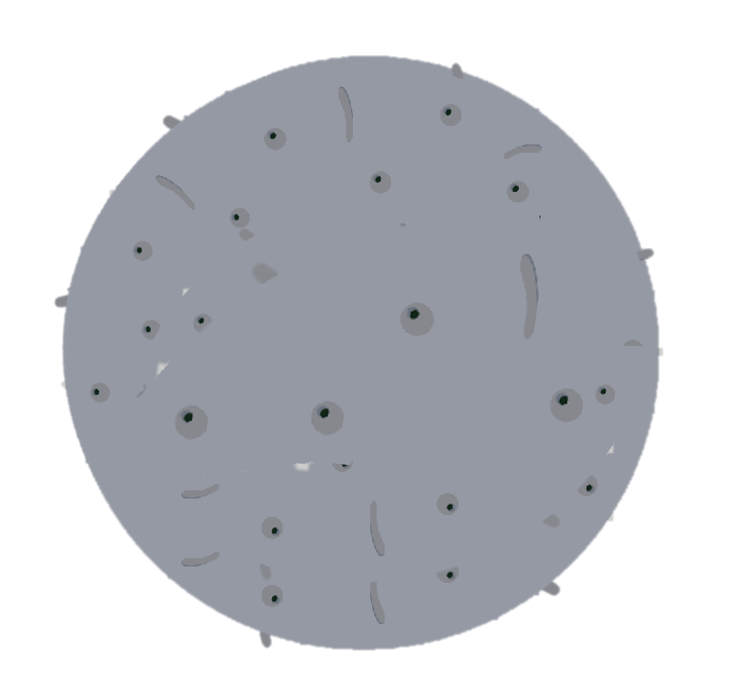 Each pole of the spindle of a dividing nucleus would have a centrosome. In animal cells and most plants and fungi with motile cells, the centrosome contains a pair of centrioles. CENTRIOLES A short cylindrical array of nine triplet microtubules. Found in animal cells and cells of most eukaryotic organisms that produce flagellate cells. CHROMATIN Complex of the DNA and proteins, such as histones, in the nucleus of a eukaryotic cell. CYTOPLASM All the material and organelles inside the plasma membrane and outside of the nucleus. 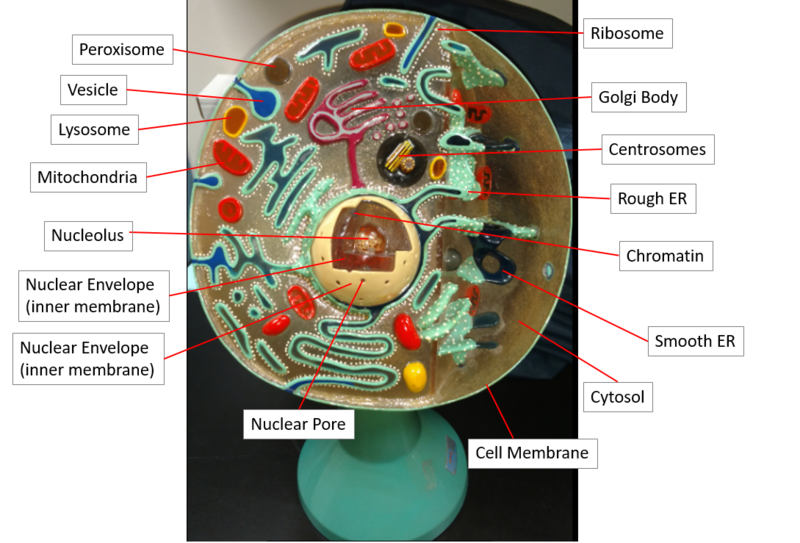 CYTOSOL Everything in the cytoplasm other than the membranebounded organelles. ENDOPLASMIC RETICULUM The endoplasmic reticulum (ER) consists of flattened sheets, sacs and tubes that extend through the cytoplasm. The sheets may be continuous with the outer membrtme of the nuclear envelope. If the ER is studded with ribosomes that are synthesizing proteins, it is called rough ER. In contrast, smooth ER lacks ribosomes and is involved in lipid synthesis. 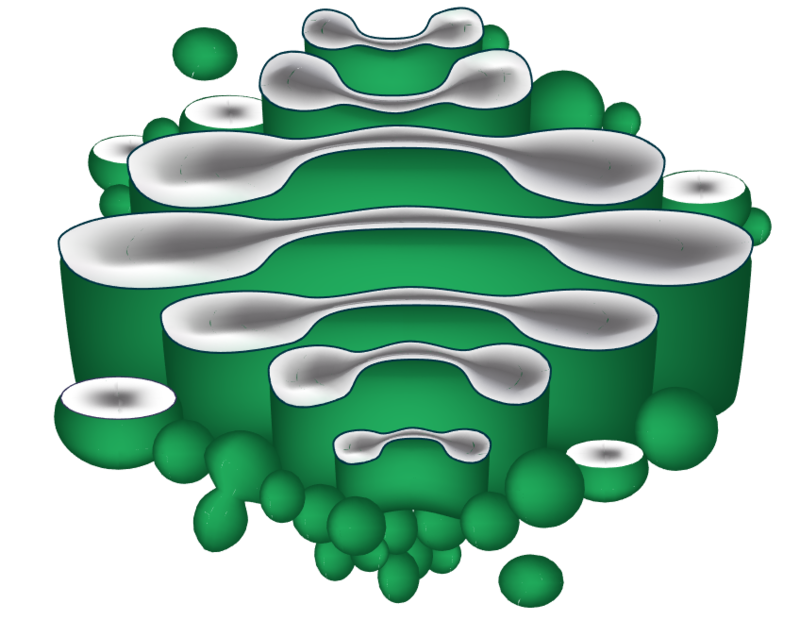 GOLGI BODY A system of stacked, membrane-bounded sacs. The Golgi is involved in processing macromolecules for secretion and delivery to other components of the cell. LYSOSOMES Membrane-bounded vesicles that contain enzymes involved in the digestion of foreign elements. Conditions that result in the release of these enzymes into the cytoplasm may result in cell death. MITOCHONDRIA Organelles present in eukaryotic cells and bounded by two membranes. They are often referred to as the power plants of cells as they are the site of aerobic respiration that combines oxygen with food molecules to generate ATP, an important energy containing molecule. Mitochondria contain circular DNA (similar to the organization of DNA in bacterial cells) that codes for some of the mitochondria! proteins. Ribosomes in mitochondria are smaller than those in the cytosol and of the same size as bacterial ribosomes. NUCLEAR ENVELOPE The double membrane structure that surrounds the nucleus and separates it from the rest of the cytoplasm. It has nuclear pores that allow for communication between the nucleus and the cytoplasm. NUCLEAR PORES Openings in the nuclear envelope that allow for communication between the nucleus and the cytoplasm. 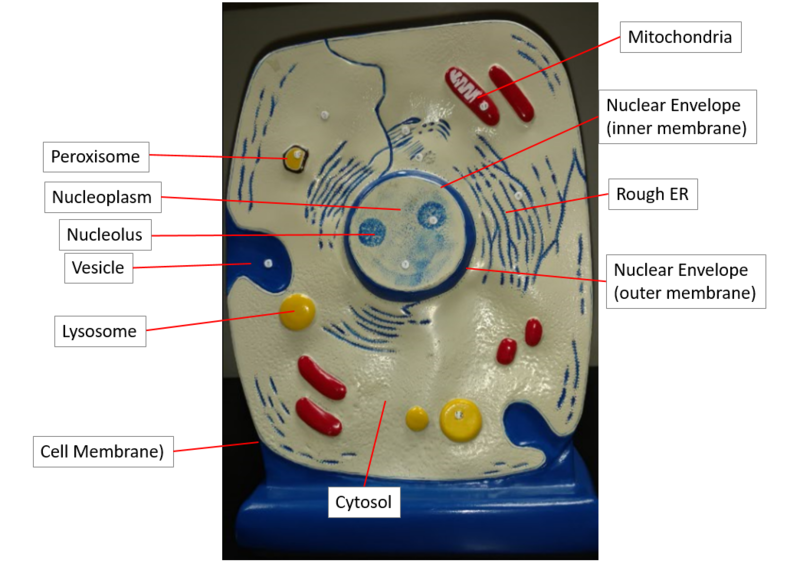 NUCLEOLUS Site in the nucleus where ribosomes are synthesized. NUCLEOPLASM Matrix of the nucleus, not including nucleolus and chromosomes. NUCLEUS This is the largest organelle in most cells. It is separated from the cytoplasm by the nuclear envelope that consists of an inner and outer membrane layer. Nuclear pores in the envelope allow the nucleus to communicate with the cytoplasm. The nucleus contains most of the cell's genetic material in the DNA that makes up the chromatin fibers of the chromosomes. 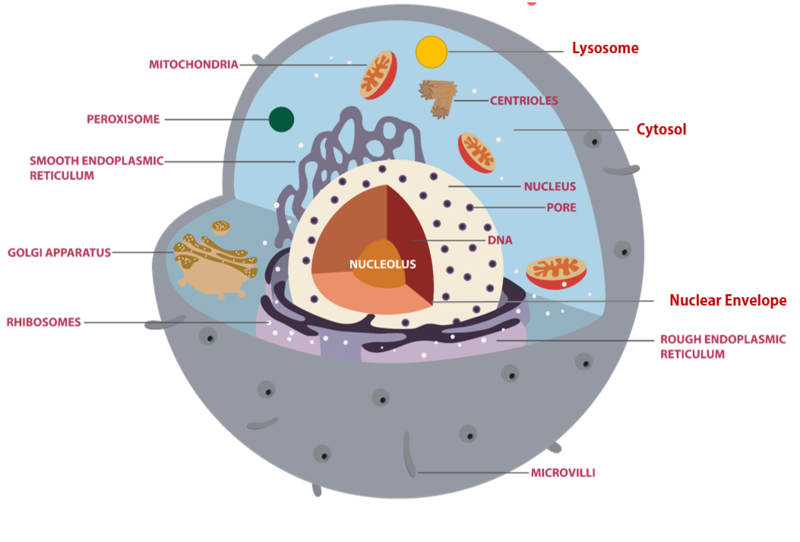 The nucleolus is in the nucleus and it is the site at which ribosomes are assembled. PLASMA MEMBRANE The outer boundary of the cell; also called the cell membrane. A sheet of lipid molecules (bilayer) with proteins embedded in it. The plasma membrane controls movement of materials into and out of the cytoplasm. RIBOSOMES Particles composed of RNA and protein that are involved with messenger RNA in the synthesis of proteins.